"I have been bullied by an usurper, I have been neglected by a court, but I will not be dictated to by a subject: your man shan’t stand. 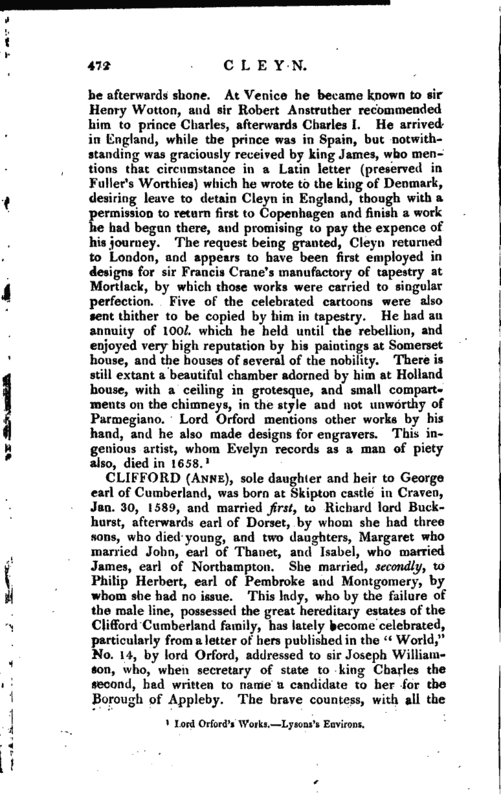 Mr. Pennant characterizes lady Anne Clifford as the most eminent person of her age for intellectual accomplishments, for spirit, magnificence, and deeds of benevolence; and he has given a particular description of two portraits of her, in the side-leaves of a family picture. Both the paintings are full lengths; one representing her at the age of thirteen, and the other in her middle age, in the state of widowhood. The books, in the first of these pictures, inform us of the fashionable course of reading among people of rank in her days. There are among them Eusebius, St. Augustine, sir Philip Sidney’s Arcadia, Godfrey of Boulogne, the French Academy, Camden, Ortelius, | and Agrippa on the Vanity of Occult Sciences. Above are the heads of Mr. SamuelDaniel, her tutor, and Mrs. Anne Taylor, her governess and this memorial of the instructors of her youth, is a most grateful acknowledgment of the benefits she received from them. The books in the second picture consist wholly of the Bible, Charron on. Wisdom, and pious treatises, excepting one of Distillations and excellent Medicines; from which may be collected what were the chief objects of the countess’s studies, in the retirement of her later days. 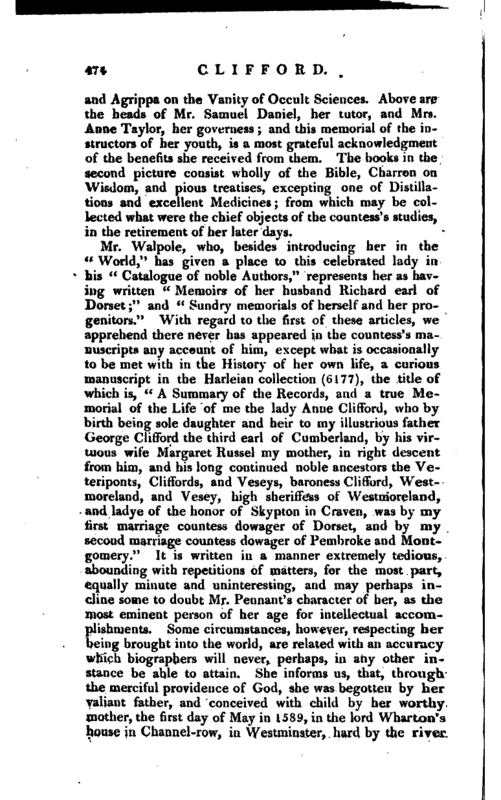 Mr. Walpole, who, besides introducing her in the “World,” has given a place to this celebrated lady in his “Catalogue of noble Authors,” represents her as having written “Memoirs of her husband Richard earl of Dorset;” and “Sundry memorials of herself and her progenitors.” With regard to the first of these articles, we apprehend there never has appeared in the countess’s manuscripts any account of him, except what is occasionally to be met with in the History of her own life, a curious manuscript in the Harleian collection (6177), the title of which is, “A Summary of the Records, and a true Memorial of the Life of me the lady Anne Clifford, who by birth being sole daughter and heir to my illustrious father George Clifford the third earl of Cumberland, by his virtuous wife Margaret Russel my mother, in right descent from him, and his long continued noble ancestors the Veteriponts, Cliffords, and Veseys, baroness Clifford, Westmoreland, and Vesey, high sheriffess of Westmoreland, and ladye of the honor of Skypton in Craven, was by my lirst marriage countess dowager of Dorset, and by my second marriage countess dowager of Pembroke and Montgomery.” It is written in a manner extremely tedious, abounding with repetitions of matters, for the most part, equally minute and uninteresting, and may perhaps incline some to doubt Mr. Pennant’s character of her, as the most eminent person of her age for intellectual accomplishments. Some circumstances, however, respecting her being brought into the world, are related with an accuracy which biographers will never, perhaps, in any other instance be able to attain. She informs us, that, through the merciful providence of God, she was begotten by her valiant father, and conceived with child by her worthy mother, the first day of May in 1589, in the lord Wharton’s house in Channel-row, in Westminster, hard by the river | of Thames, as Psalm 139; yet that she was not born till the 30th day of January following, when her blessed mother brought her forth in one of her father’s chief nouses, called Skypton castle, in Craven. Biog Biog. Brit. 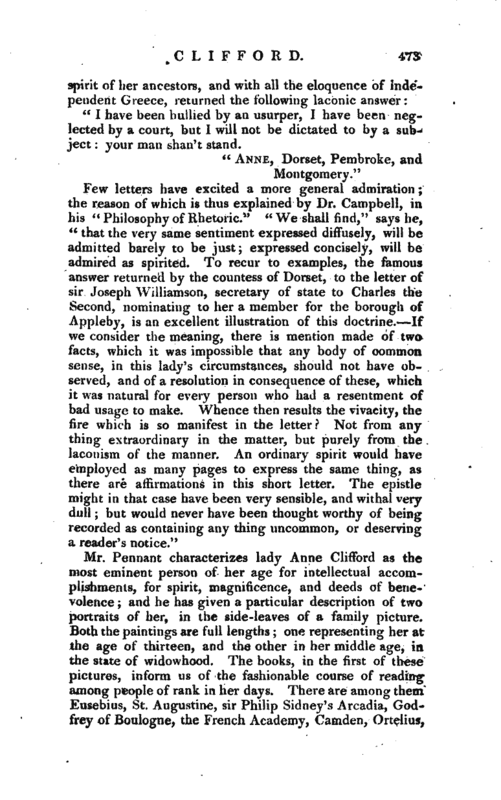 Park’s edition of the Royal and Noble Authors. 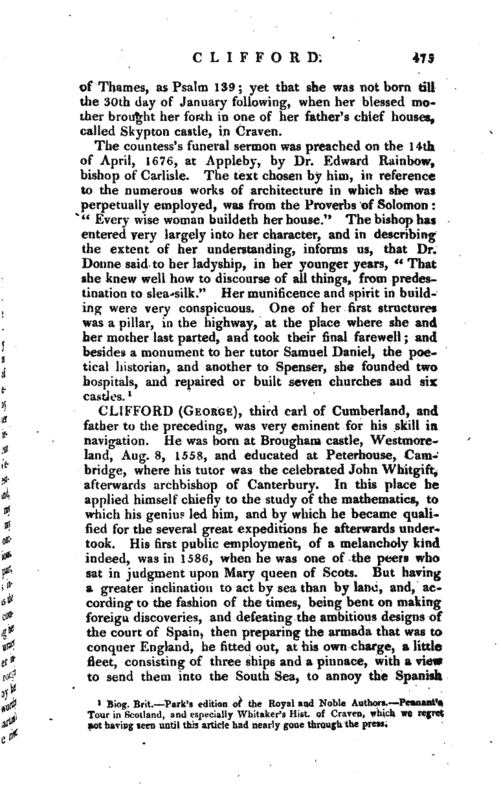 Pennant’s Tour in Scotland, and especially Whitaker’s Hist, of Craven, which we regret not having seen until this article had nearly gone through the press.